Jacksonville is nestled perfectly in the heart of it all! One hour north you meet the Wild Horses on Shackleford Banks, one hour south takes you to the Battleship North Carolina. Home to Camp Lejeune, New River Air Station and MARSOC, Jacksonville is also where the oldest continuously operating USO in the world is located! Jacksonville is a diverse community that offers everything on your checklist. The river and intra-coastal waterway yields world famous oysters, shrimp and crabs . The breathtaking beaches bordering Onslow County have been a major attraction for residents and tourist. Some of the other favorites are the delicious seafood, scenic miles of trails, camping, parks, horseback riding, golfing, historic areas, water sports and boating activities. With an array of shops and restaurants, Jacksonville offers all the amenities of a larger city without losing its relaxing country feel. It’s a great place to call home & raise a family! Call us at 910-353-7755 or click here to Search for your dream home today! This military base was established in 1941. It is the “Home of Expeditionary Forces in Readiness”. Lejeune is over 150,000 acres and with the surrounding community of Jacksonville/Onslow County, it services approximately 180,000 active duty, retiree, civilian and dependent personnel. It is also home to MARSOC in Sneads Ferry, the U.S. Marines Corps Forces Special Operations Command. 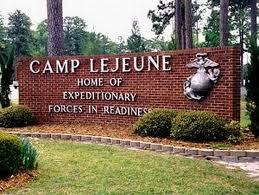 Camp Lejeune is a six-time recipient of the Commander-in-Chief’s Award for Installation Excellence. The Marines, sailors, Coast Guardsmen and civilian Marines play an important role for the efficient management of Camp Lejeune which borders Onslow County!